Let's take a look at how Thread identifies each device in the network, and what types of addresses they use to communicate with each other. Key Term: In this primer, the term "interface" is used to identify an endpoint of a Thread device within a network. Typically, a single Thread device has a single Thread interface. The first two scopes correspond to prefixes designated by a Thread network. 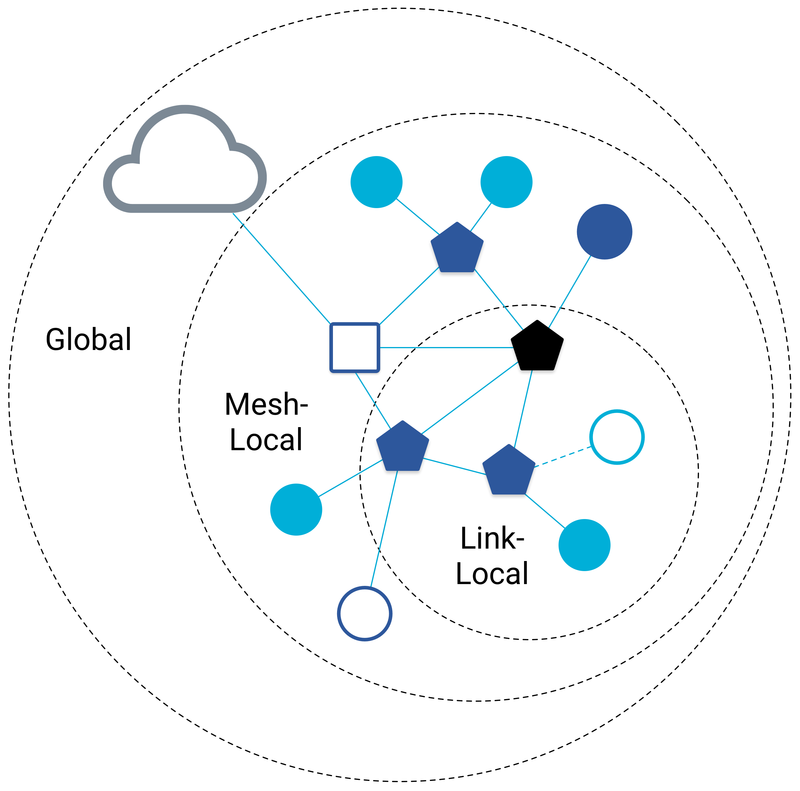 Link-Local have prefixes of fe80::/16, while Mesh-Local have prefixes of fd00::/8. There are multiple IPv6 unicast addresses that identify a single Thread device. Each has a different function based on the scope and use case. Before we detail each type, let's learn more about a common one, called the Routing Locator (RLOC). 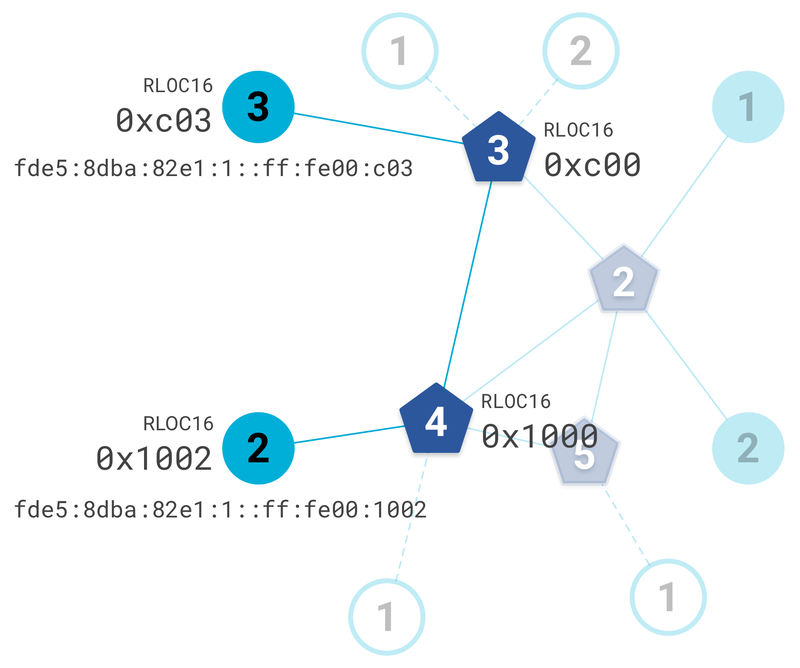 The RLOC identifies a Thread interface, based on its location in the network topology. Each Child's Router ID corresponds to their Parent (Router). Because a Router is not a Child, the Child ID for a Router is always 0. 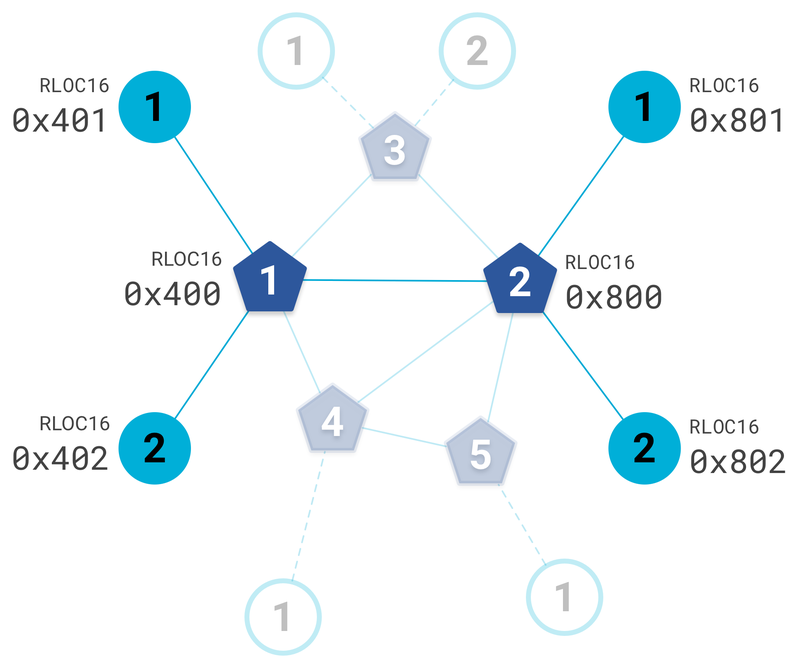 Together, these values are unique for each device in the Thread network, and are used to create the RLOC16, which represents the last 16 bits of the RLOC. The RLOC16 is part of the Interface Identifier (IID), which corresponds to the last 64 bits of the IPv6 address. Some IIDs can be used to identify some types of Thread interfaces. For example, the IID for RLOCs is always of the form 0000:00ff:fe00:RLOC16. However, because the RLOC is based on the location of the node in the topology, the RLOC of a node can change as the topology changes. The RLOC is just one of many IPv6 unicast addresses a Thread device can have. Another category of addresses are called Endpoint Identifiers (EIDs), which identify a unique Thread interface within a Thread network partition. EIDs are independent of Thread network topology. Common unicast types are detailed below. An EID that identifies a Thread interface reachable by a single radio transmission. An EID that identifies a Thread interface, independent of network topology. Used to reach a Thread interface within the same Thread partition. Also called a Unique Local Address (ULA). Identifies a Thread interface, based on its location in the network topology. Identifies a Thread interface via RLOC lookup, when the RLOC of a destination is not known. An EID that identifies a Thread interface on a global scope, beyond a Thread network. Multicast is used to communicate information to multiple devices at once. In a Thread network, specific addresses are reserved for multicast use with different groups of devices, depending on the scope. Key Point: A major difference between FTDs and MTDs are that FTDs subscribe to the ff03::2 multicast address. MTDs do not. You might notice that Sleepy End Devices (SEDs) are not included as a recipient in the multicast table above. There is an additional unicast prefix-based multicast address used for All Thread Nodes, including SEDs. This multicast address varies by Thread network, because it is built on the unicast Mesh-Local prefix. Arbitrary scopes beyond those already listed are also supported for Thread devices. Anycast is used to route traffic to a Thread interface when the RLOC of a destination is not known. An Anycast Locator (ALOC) identifies the location of multiple interfaces within a Thread partition. The last 16 bits of an ALOC, called the ALOC16, is in the format of 0xfcXX, which represents the type of ALOC. For example, an ALOC16 between 0xfc01 and 0xfc0f is reserved for DHCPv6 Agents. 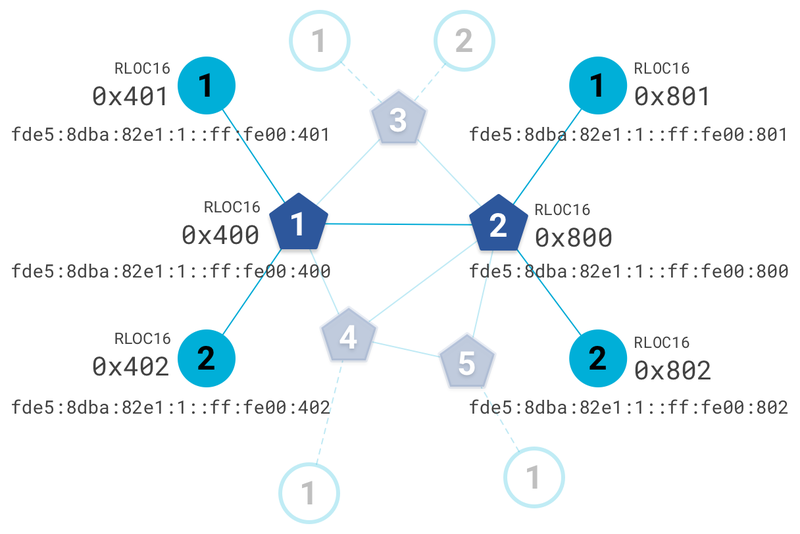 If the specific DHCPv6 Agent RLOC is unknown (perhaps because the network topology has changed), a message can be sent to a DHCPv6 Agent ALOC to obtain the RLOC. To learn more about Thread's IPv6 addressing, see sections 5.2 and 5.3 of the Thread Specification.